The Dodge County Fair Association is seeking applicants age 15 and older for the position of Grounds Crew. Approximately 30 temporary positions need to be filled from August 5th to the 23rd for set-up, cleaning and tear down. Job tasks vary in difficulty; applicants must be able to lift a full bag/barrel of garbage and work well with others. Experience with cleaning, landscaping or farm work is a plus. A lot of work goes in to getting everything in its place and ready for the big crowds. Buildings need cleaning, signs posted, fence installed and garbage cans distributed just to name a few. The grounds crew works 8am to 4:30pm during set-up week. During the Fair, from Wednesday, August 14th to Sunday, August 18th crews split into two shifts. First shift 6am to 2:30pm and second shift 2:30pm to 11pm. Crews work at a fast pace to keep the grounds looking good, garbage cans empty and supplies full. After the Fair everything has be taken down, put away and cleaned up. Picking up debris across the large 75 acre facility takes a lot of teamwork and dedication. Clean-up hours are normally 8am to 4:30pm. APPLY IN PERSON weekdays 9am to 4pm at the Dodge County Fair Office located near the Main Grandstand at the Fairgrounds, 3 Miles East of Beaver Dam, WI. Call the Fair Office with questions at 920-885-3586 or leave a reply in the comment box below. We can’t do it without you! 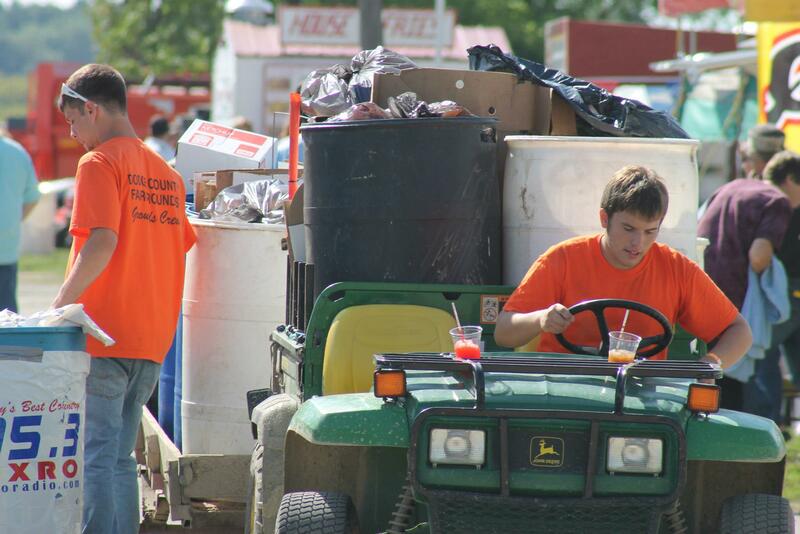 Join our team and tell your friends you helped make the 2013 Dodge County Fair possible! My grandson is looking to sign up for working the fair. Please fill out an application at the Fair Office from 9am to 4pm, Monday through Friday. Just wondering if there were still any jobs available. Ive gone to the fair several years now and also had stuff in the fair one year. So I feel this could be a good fit for me. I also was born and raised on a farm and worked on different farms as a kid. Yes, we still need grounds crew and maintenance workers! Please apply in person at the Fair Office weekdays from 9am to 4pm. Call 920-885-3586 with questions or post comments here. Yes, we are accepting applications at the Fair Office and need more help ASAP! Thanks for asking! What is the pay per hour? 7.25 per hour to start with a .25 cent raise each returning year. Are there any other positions that you need other than housekeeping positions? Not at this time, you can leave your contact information with the Fair Office by calling 920-885-3586. With your permission they will share your information with vendors who may hire you directly.